A member of Teri's karate dojo was injured sparring and knowing he was a biker, I picked up this issue of "Bike" to cheer him up during his hospital stay. He had been releasedbefore got to see him so "Bike" sat on our coffee table for weeks in the fall of 1998. Teri saw me peruse it on a regular basis and one evening said "You ought to get a bike again." 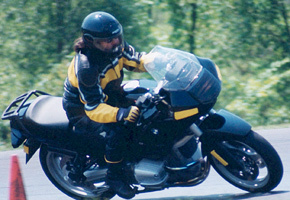 My first bike in nearly 25 years was this BMW R1100RS, a nice combo for touring, two-up riding and just sporty enough for riding some twisty roads without being put to sleep. While looking for a rider-to-passenger intercom (at the time it seemed a good idea) I found a Ducati dealer who carried what I wanted. I noticed right off this dealership had a noticeably higher energy level than most. Everyone talked racing. And "track days." Two weeks later there I was, on the track with them, looking like a tree stump in the seat. Between that May and September of 1999 I spent five weekends at the track. 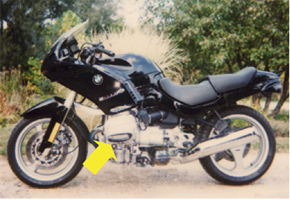 I rode the BMW 125 miles each way with the tools to take off the parts not permitted on track, and to safety wire the ones not permitted to fall off. Pat, the Ducati dealer and accomplished racer, showed me the proper lines around the track. Mid-season I was grinding through an expensive set of cylinder head protectors every weekend. Teri suggested, "Maybe you need something smaller - made for the track." 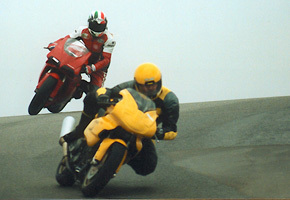 Pat recommended an entry-level Ducati, the Supersport 750. Modest power, predictable and agile handling suited to a novice. I bought the bike on Thursday, put 600 break-in miles that first weekend, and was back to the dealer Monday for first service and baseline dyno. Not one to rush things, I was at the track 5 days later for Dan Schmitt's Team Chicago race school. 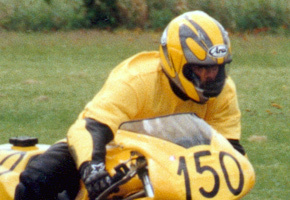 The Team Chicago school was followed in two weeks by the novice race school required by the local road racing club: Great Lakes Road Racing Asssociation. GLRRA's race school was designed to teach the basics of racing and extract a commitment to the personal safety of our fellow racers. After a full day of class sessions the graduation requirement was to complete five mock-race laps without falling down. It was raining. The early April temperature had dropped to 40 degrees. But everyone graduated... slowly. The next day, Saturday, was the first day of actual racing. Each new racer wears a great flapping yellow tee-shirt over their leathers with black chevrons on the back and in large print: "Caution - SQUID ahead."